To enhance the transparency of health service delivery, waiting time for new case bookings at orthopaedics specialist out-patient clinics (SOPC) has been posted on the website of the Hospital Authority (HA) since July 31, 2014. The map shows the distribution of orthopaedics SOPCs and the waiting time for a new clinically stable orthopaedic patient by HA hospital clusters. As indicated by pushpin symbols, there are currently 19 orthopaedics SOPCs in 7 hospital clusters. The size of the pushpins varies by the number of out-patient attendances in 2012/2013. 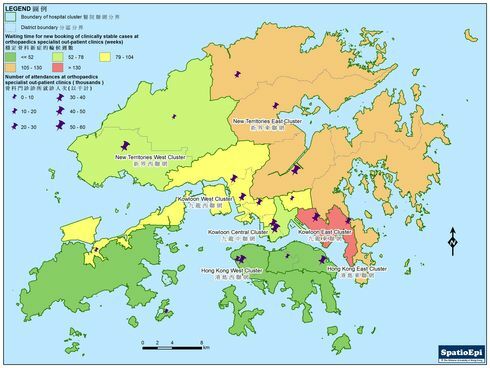 The number of out-patient attendances was relatively evenly distributed in SOPCs in Kowloon West cluster. In other HA clusters, cases were clustered in some larger regional hospitals. As depicted by graduated colours, the difference in waiting time for a newly referred orthopaedic case to receive specialist consultation could be more than 80 weeks. Population structure and variation of resource allocation may have affected the demand and supply for orthopaedics services, and consequently the waiting time for patients. To ensure that patients with urgent medical conditions in Hong Kong can be treated with priority, a triage system has been implemented for appointment bookings of all new cases referred to specialist out-patient clinics operated under Hospital Authority (HA). New referrals are usually screened by a nurse, followed by a specialist doctor of the relevant specialty. Patients would then be classified into priority 1 (urgent), priority 2 (semi-urgent) or routine category. Urgent and semi-urgent cases are normally treated within 2 and 8 weeks, respectively. Despite variations in waiting time for specialist out-patient services, HA encourages patients to seek medical consultation in the geographic cluster where they reside. By doing so, follow-up of their chronic conditions and the provision of community support can be facilitated.